This article contains Pashto text, written from right to left with some letters joined. Without proper rendering support, you may see unjoined letters or other symbols instead of Pashto script. 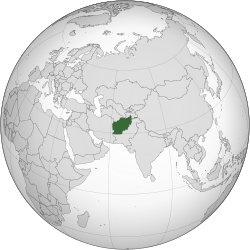 Afghanistan ( /æfˈɡænɪstæn/; Persian: افغانستان; Pashto: Afġānistān‎), officially the Islamic Republic of Afghanistan, is a landlocked sovereign state forming part of South Asia, Central Asia, and to some extent Western Asia. It has a population of around 30 million inhabiting an area of approximately 647,500 km2 (250,001 sq mi), making it the 42nd most populous and 41st largest nation in the world. It is bordered by Pakistan in the south and the east, Iran in the west, Turkmenistan, Uzbekistan and Tajikistan in the north, and China in the far northeast. Afghanistan has been an ancient focal point of the Silk Road and human migration. Archaeologists have found evidence of human habitation from as far back as the Middle Paleolithic. Urban civilization may have begun in the area as early as 3,000 to 2,000 BCE. Sitting at an important geostrategic location that connects the Middle East culture with Central Asia and the Indian subcontinent, the land has been home to various peoples through the ages and witnessed many military campaigns, notably by Alexander the Great, Genghis Khan, and in modern era Western forces. 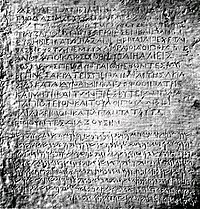 The land also served as a source from which the Greco-Bactrians, Kushans, Hephthalites, Saffarids, Ghaznavids, Ghorids, Khiljis, Timurids, Mughals, Durranis, and others have risen to form major empires. The political history of the modern state of Afghanistan begins in 1709, when the Hotaki dynasty was established in Kandahar followed by Ahmad Shah Durrani's rise to power in 1747. In the late 19th century, Afghanistan became a buffer state in the "Great Game" between the British and Russian empires. 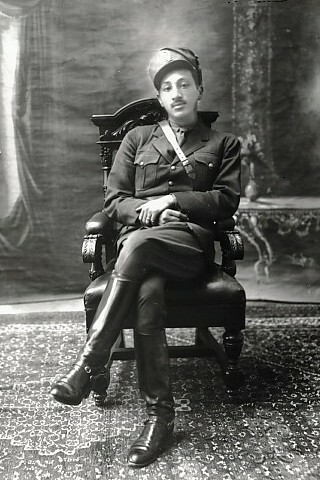 Following the 1919 Anglo-Afghan War, King Amanullah began a European style modernization of the country but was stopped by the ultra-conservatives. During the Cold War, after the withdrawal of the British from neighboring India in 1947, the United States and the Soviet Union began spreading influences in Afghanistan, which led to a bloody war between the US-backed mujahideen forces and the Soviet-backed Afghan government in which over a million Afghans lost their lives. This was followed by the 1990s civil war, the rise and fall of the extremist Taliban government and the 2001–present war. In December 2001, the United Nations Security Council authorized the creation of the International Security Assistance Force (ISAF) to help maintain security in Afghanistan and assist the Karzai administration. Three decades of war made Afghanistan the world's most dangerous country, including the largest producer of refugees and asylum seekers. While the international community is rebuilding war-torn Afghanistan, terrorist groups such as the Haqqani Network and Hezbi Islami are actively involved in a nationwide Taliban-led insurgency, which includes hundreds of assassinations and suicide attacks. According to the United Nations, the insurgents were responsible for 80% of civilian casualties in 2011 and 2012. The name Afghānistān (Persian: افغانستان, [avɣɒnestɒn]) means "Land of the Afghans", which originates from the ethnonym "Afghan". Historically, the name "Afghan" mainly designated the Pashtun people, the largest ethnic group of Afghanistan. This name is mentioned in the form of Abgan in the 3rd century CE by the Sassanians and as Avagana (Afghana) in the 6th century CE by Indian astronomer Varahamihira. A people called the Afghans are mentioned several times in a 10th century geography book, Hudud al-'alam, particularly where a reference is made to a village: "Saul, a pleasant village on a mountain. In it live Afghans." 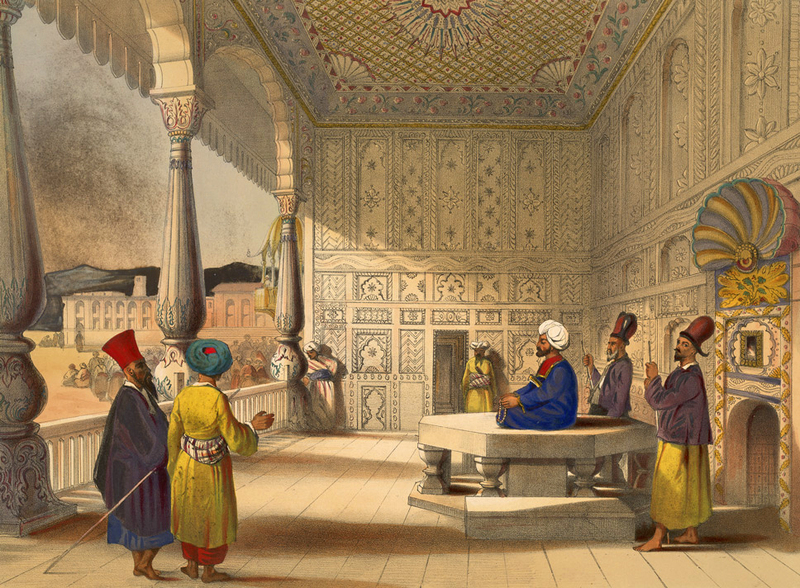 The name "Afghaunistan" is written on this 1847 lithograph by James Rattray. "The men of Kábul and Khilj also went home; and whenever they were questioned about the Musulmáns of the Kohistán (the mountains), and how matters stood there, they said, "Don't call it Kohistán, but Afghánistán; for there is nothing there but Afgháns and disturbances." Thus it is clear that for this reason the people of the country call their home in their own language Afghánistán, and themselves Afgháns." "Pull out your sword and slay any one, that says Pashtun and Afghan are not one! Arabs know this and so do Romans: Afghans are Pashtuns, Pashtuns are Afghans!" "an extensive country of Asia...between Persia and the Indies, and in the other direction between the Hindu Kush and the Indian Ocean. It formerly included the Persian provinces of Khorassan and Kohistan, together with Herat, Beluchistan, Cashmere, and Sinde, and a considerable part of the Punjab... Its principal cities are Kabul, the capital, Ghuznee, Peshawer, and Kandahar." The Afghan kingdom was sometimes referred to as the Kingdom of Kabul, as mentioned by the British statesman and historian Mountstuart Elphinstone. Afghanistan was officially recognized as a sovereign state by the international community after the Anglo-Afghan Treaty of 1919 was signed. 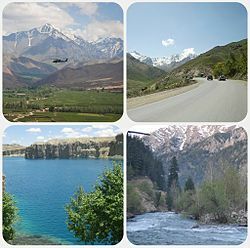 A landlocked mountainous country with plains in the north and southwest, Afghanistan is described as being located within South Asia or Central Asia. It is part of the Greater Middle East Muslim world, which lies between latitudes 29° N and 39° N, and longitudes 60° E and 75° E. The country's highest point is Noshaq, at 7,492 metres (24,580 feet) above sea level. Between the 4th and 19th centuries the northwestern area of modern Afghanistan was referred to by the regional name as Khorasan. Two of the four capitals of Khorasan (Herat and Balkh) are now located in Afghanistan, while the regions of Kandahar, Zabulistan, Ghazni, Kabulistan and Afghanistan formed the frontier between Khorasan and Hindustan. A miniature from Padshahnama depicting the surrender of the Safavid garrison of Kandahar in 1638 to the Mughals, which was re-taken by the Safavids in 1649 during the Mughal-Safavid war. Afghanistan became one of the main centers in the Muslim world during the Islamic Golden Age. 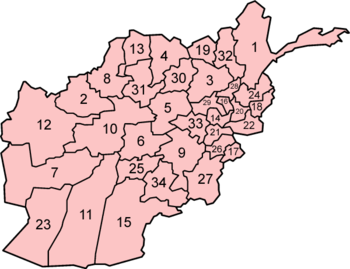 By the 11th century Sultan Mahmud of Ghazni had finally Islamized all of the remaining non-Muslim areas, with the exception of the Kafiristan region. The Ghaznavids were replaced by the Ghurids who expanded and advanced the already powerful empire. In 1219 AD, Genghis Khan and his Mongol army overran the region. His troops are said to have annihilated the Khorasanian cities of Herat and Balkh as well as Bamyan. The destruction caused by the Mongols depopulated major cities and forced many of the locals to revert to an agrarian rural society. Mongol rule continued with the Ilkhanate in the northwest while the Khilji dynasty controlled the Afghan tribal areas south of the Hindu Kush, until the invasion of Timur who established the Timurid dynasty in 1370. During the Ghaznavid, Ghurid, and Timurid eras, Afghanistan produced many fine Islamic architectural monuments as well as numerous scientific and literary works. Babur, a descendant of both Timur and Genghis Khan, arrived from Fergana and captured Kabul from the Arghun dynasty, and from there he began to seize control of the central and eastern territories of Afghanistan. He remained in Kabulistan until 1526 when he and his army invaded Delhi in India to replace the Afghan Lodi dynasty with the Mughal Empire. From the 16th century to the early 18th century, Afghanistan was part of three regional kingdoms: the Khanate of Bukhara in the north, the Shi'a Safavids in the west and the remaining larger area was ruled by the Mughal Empire. Ahmad Shah Durrani, founder of the last Afghan empire and viewed as Father of the Nation. Following the 1842 massacre of Elphinstone's Army and victory of Afghan forces, led by Akbar Khan, the British established diplomatic relations with the Afghan government but withdrew all forces from the country. They returned during the Second Anglo-Afghan War in the late 1870s for about two-year military operations, which was to defeat Ayub Khan and assist Abdur Rahman Khan establish authority. The United Kingdom began to exercise a great deal of influence after this and even controlled the state's foreign policy. In 1893, Mortimer Durand made Amir Abdur Rahman Khan sign a controversial agreement in which the ethnic Pashtun and Baloch territories were divided by the Durand Line. This was a standard divide and rule policy of the British and would lead to strained relations, especially with the later new state of Pakistan. King Amanullah sitting next to German President Paul von Hindenburg in February 1928. In April 1978, the communist People's Democratic Party of Afghanistan (PDPA) seized power in Afghanistan in the Saur Revolution. Within months, opponents of the communist government launched an uprising in eastern Afghanistan that quickly expanded into a civil war waged by guerrilla mujahideen against government forces countrywide. The Pakistani government provided these rebels with covert training centers, while the Soviet Union sent thousands of military advisers to support the PDPA government. Meanwhile, increasing friction between the competing factions of the PDPA — the dominant Khalq and the more moderate Parcham — resulted in the dismissal of Parchami cabinet members and the arrest of Parchami military officers under the pretext of a Parchami coup. By mid-1979, the United States had started a covert program to assist the mujahideen. At the time some believed the Soviets were attempting to expand their borders southward in order to gain a foothold in the Middle East. The Soviet Union had long lacked a warm water port, and their movement south seemed to position them for further expansion toward Pakistan in the East, and Iran to the West. American politicians, Republicans and Democrats alike, feared the Soviets were positioning themselves for a takeover of Middle Eastern oil. Others believed that the Soviet Union was afraid Iran's Islamic Revolution and Afghanistan's Islamization would spread to the millions of Muslims in the USSR. The PDPA prohibited usury, made statements on women's rights by declaring equality of the sexes and introducing women to political life. 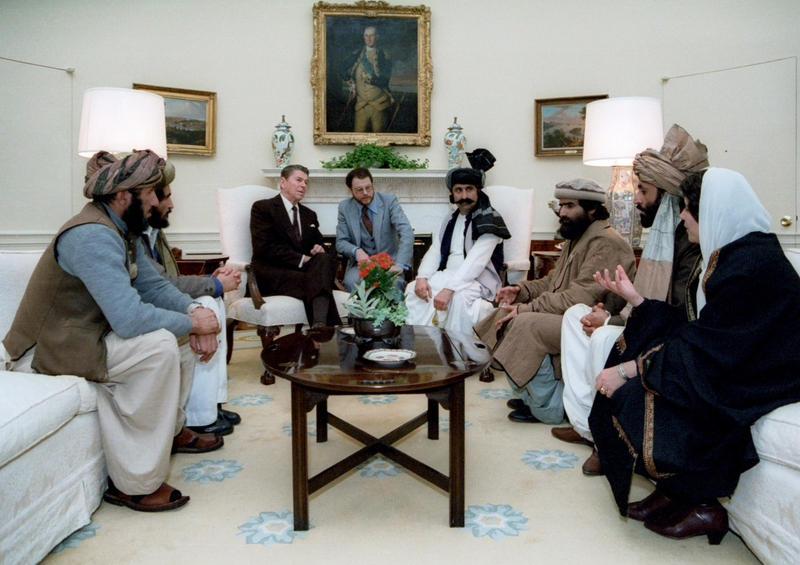 U.S. President Ronald Reagan listening to a delegation of mujahideen leaders at the White House in 1983. After the invasion, President Jimmy Carter announced what became known as the Carter Doctrine: that the U.S. would not allow any other outside force to gain control of the Persian Gulf. He terminated the Soviet Wheat Deal in January 1980, which was intended to establish trade with USSR and lessen Cold War tensions. The grain exports had been beneficial to people employed in agriculture, and the Carter embargo marked the beginning of hardship for American farmers. That same year, Carter also made two of the most unpopular decisions of his entire Presidency: prohibiting American athletes from participating in the 1980 Summer Olympics in Moscow, and reinstating registration for the draft for young males. Following the Soviet invasion, the United States supported diplomatic efforts to achieve a Soviet withdrawal. In addition, generous U.S. contributions to the refugee program in Pakistan played a major part in efforts to assist Afghan refugees. The Reagan administration increased arming and funding of the mujahideen as part of the Reagan Doctrine, thanks in large part to the efforts of Charlie Wilson and CIA officer Gust Avrakotos. Early reports estimated $6–20 billion but more recent reports suggest that up to $40 billion were provided by the U.S. and Saudi Arabia to Pakistan. This was in the forms of cash and weapons, which included over two thousand FIM-92 Stinger surface-to-air missiles. The sovereignty of Afghanistan was vested formally in the Islamic State of Afghanistan, an entity created in April 1992, after the fall of the Soviet-backed Najibullah government... With the exception of Gulbuddin Hekmatyar's Hezb-e Islami, all of the parties...were ostensibly unified under this government in April 1992... Hekmatyar's Hezb-e Islami, for its part, refused to recognize the government for most of the period discussed in this report and launched attacks against government forces and Kabul generally... Shells and rockets fell everywhere. Pakistan was keen to gear up for a breakthrough in Central Asia... Islamabad could not possibly expect the new Islamic government leaders...to subordinate their own nationalist objectives in order to help Pakistan realize its regional ambitions... Had it not been for the ISI's logistic support and supply of a large number of rockets, Hekmatyar's forces would not have been able to target and destroy half of Kabul. The Taliban started shelling Kabul in early 1995 but were defeated by forces of the Islamic State government under Ahmad Shah Massoud. Amnesty International, referring to the Taliban offensive, wrote in a 1995 report: "This is the first time in several months that Kabul civilians have become the targets of rocket attacks and shelling aimed at residential areas in the city." Taliban religious police beating an Afghan woman for removing her burqa in public. President Pervez Musharraf – then as Chief of Army Staff – was responsible for sending thousands of Pakistanis to fight alongside the Taliban and bin Laden against the forces of Massoud. According to Pakistani Afghanistan expert Ahmed Rashid, "between 1994 and 1999, an estimated 80,000 to 100,000 Pakistanis trained and fought in Afghanistan" on the side of the Taliban. In 2001 alone, there were believed to be 28,000 Pakistani nationals, many either from the Frontier Corps or army, fighting inside Afghanistan. An estimated 8,000 Pakistani militants were recruited in madrassas filling the ranks of the estimated 25,000 regular Taliban force. A 1998 document by the U.S. State Department confirms that "20–40 % of [regular] Taliban soldiers are Pakistani." The document further stated that the parents of those Pakistani nationals "know nothing regarding their child's military involvement with the Taliban until their bodies are brought back to Pakistan." 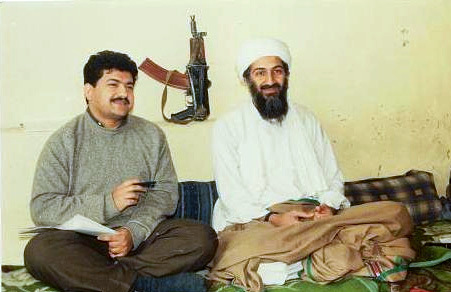 Pakistani journalist Hamid Mir interviewing al-Qaida leader Osama bin Laden in November 2001. Ahmad Shah Massoud remained the only leader of the United Front in Afghanistan. In the areas under his control Massoud set up democratic institutions and signed the Women's Rights Declaration. Human Rights Watch cites no human rights crimes for the forces under direct control of Massoud for the period from October 1996 until the assassination of Massoud in September 2001. As a consequence many civilians fled to the area of Ahmad Shah Massoud. In total, estimates range up to one million people fleeing the Taliban. National Geographic concluded in its documentary "Inside the Taliban": "The only thing standing in the way of future Taliban massacres is Ahmad Shah Massoud." On 9 September 2001, Ahmad Shah Massoud was assassinated by two Arab suicide attackers inside Afghanistan and two days later about 3,000 people were killed in the September 11 attacks in the United States. The US government identified Osama bin Laden, Khalid Sheikh Mohammed and the Al-Qaeda organization based in and allied to the Taliban's Islamic Emirate of Afghanistan as the perpetrators of the attacks. From 1990 until this date over 400,000 Afghan civilians had already died in the wars in Afghanistan. The Taliban refused to hand over bin Laden to US authorities and to disband al-Qaeda bases in Afghanistan. Bin Laden later claimed sole responsibility for the September 11 attacks and specifically denied any prior knowledge of them by the Taliban or the Afghan people. In October 2001, Operation Enduring Freedom was launched as a new phase of the war in Afghanistan in which teams of American and British special forces worked with ground forces of the United Front (Northern Alliance) to remove the Taliban from power and dispel Al-Qaeda. At the same time the US-led forces were bombing Taliban and al-Qaida targets everywhere inside Afghanistan with cruise missiles. These actions led to the fall of Mazar-i-Sharif in the north followed by all the other cities, as the Taliban and al-Qaida fled over the porous Durand Line border into Pakistan. In December 2001, after the Taliban government was toppled and the new Afghan government under Hamid Karzai was formed, the International Security Assistance Force (ISAF) was established by the UN Security Council to help assist the Karzai administration and provide basic security to the Afghan people. I should say that Taliban are not fighting to be accommodated. They are fighting to bring the state down. So it's a futile exercise, and it's just misleading. ... There are groups that will fight to the death. Whether we like to talk to them or we don't like to talk to them, they will continue to fight. So, for them, I don't think that we have a way forward with talks or negotiations or contacts or anything as such. Then we have to be prepared to tackle and deal with them militarily. In terms of the Taliban on the ground, there are lots of possibilities and opportunities that with the help of the people in different parts of the country, we can attract them to the peace process; provided, we create a favorable environment on this side of the line. At the moment, the people are leaving support for the government because of corruption. So that expectation is also not realistic at this stage. In choosing to use violent extremism as an instrument of policy, the government of Pakistan, and most especially the Pakistani army and ISI, jeopardizes not only the prospect of our strategic partnership but Pakistan's opportunity to be a respected nation with legitimate regional influence. They may believe that by using these proxies, they are hedging their bets or redressing what they feel is an imbalance in regional power. But in reality, they have already lost that bet. People wait to receive ballots from election workers during the 2005 parliamentary election. The Afghan Ministry of Foreign Affairs is responsible for managing the foreign relations of Afghanistan. The nation has been a member of the UN since 1946, and has maintained good relations with the United States and other NATO member states since the signing of the Anglo-Afghan Treaty in 1919. The United Nations Assistance Mission in Afghanistan (UNAMA) was established in 2002 under United Nations Security Council Resolution 1401 to help the nation recover from decades of war and establish a normal functioning government. Today, more than 22 NATO nations deploy about 100,000 troops in Afghanistan as part of the International Security Assistance Force (ISAF). Apart from close military links, the country also enjoys strong economic relations with NATO members and their allies. It also has diplomatic relations with neighboring Pakistan, Iran, Turkmenistan, Uzbekistan, Tajikistan, the People's Republic of China, including regional states such as India, Turkey, Kazakhstan, Russia, United Arab Emirate, Saudi Arabia, Iraq, Egypt, Japan, South Korea, and others. Afghanistan–Pakistan relations have been negatively affected by issues related to the Durand Line, the 1978–present war (i.e. Mujahideen, Afghan refugees, Taliban insurgency, and border skirmishes), including water and the growing influence of India in Afghanistan. Afghan officials often allege that Pakistani and Iranian intelligence agencies are involved in terrorist attacks inside Afghanistan, by training and guiding terrorists to carry out attacks. On the positive side, the two nations are usually described in Afghanistan as "inseparable brothers", which is due to historical, religious, and ethnolinguistical connections, as well as trade and other ties. Afghanistan has always depended on Pakistani trade routes for import and export but this has changed in the last decade with the opening of Central Asian and Iranian routes. Conversely, Pakistan depends on Afghan water and considers Afghanistan as the only trade route to Central Asian resources. The military of Afghanistan is under the Ministry of Defense, which includes the Afghan National Army (ANA) and the Afghan Air Force (AAF). It currently has about 200,000 active soldiers and is expected to reach 260,000 in the coming years. They are trained and equipped by NATO countries, mainly by the United States Department of Defense. 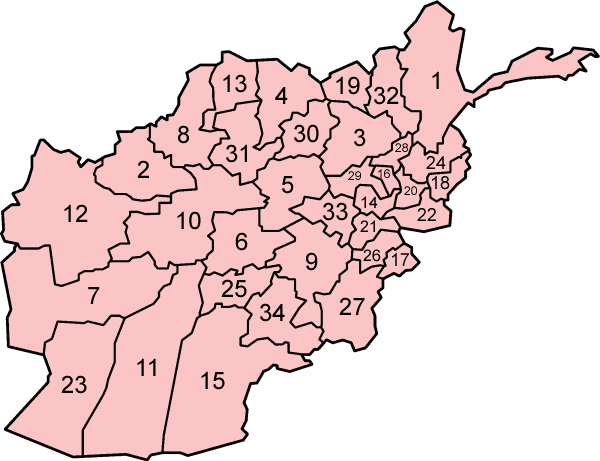 The ANA is divided into 7 major Corps, with the 201st Selab ("Flood") in Kabul followed by the 203rd in Gardez, 205th Atul ("Hero") in Kandahar, 207th in Herat, 209th in Mazar-i-Sharif and the 215th in Lashkar Gah. The ANA also has a commando brigade which was established in 2007. The National Military Academy of Afghanistan serves as the main educational institute for the militarymen of the country. A new $200 million Afghan Defense University (ADU) is under construction near the capital. U.S. Army providing security in 2011 while ANP officers conduct routine vehicle inspections at Freedom Circle in the heart of downtown Kabul. The police are being trained by NATO countries through the Afghanistan Police Program. According to a 2009 news report, a large proportion of police officers are illiterate and are accused of demanding bribes. Jack Kem, deputy to the commander of NATO Training Mission Afghanistan and Combined Security Transition Command Afghanistan, stated that the literacy rate in the ANP will rise to over 50% by January 2012. What began as a voluntary literacy program became mandatory for basic police training in early 2011. Approximately 17% of them test positive for illegal drug use. In 2009, President Karzai created two anti-corruption units within the Interior Ministry. Former Interior Minister Hanif Atmar said that security officials from the U.S. (FBI), Britain (Scotland Yard) and the European Union will train prosecutors in the unit. Afghan women at a textile factory in Kabul. A potato farmer being interviewed at one of his fields in Bamyan Province. Potatoes have become the main cash crop for the province, contributing millions of dollars to its economy every year. Afghanistan is an impoverished and least developed country, one of the world's poorest due to the decades of war and nearly complete lack of foreign investment. The nation's GDP stands at about $29 billion with an exchange rate of $18 billion, and the GDP per capita is about $1,000. The country's export was $2.6 billion in 2010. Its unemployment rate is about 35% and roughly the same percentage of its citizens live below the poverty line. About 42% of the population live on less than $1 a day, according to a 2009 report. On the positive side, the nation has less than $1.5 billion external debt and is recovering by the assistance of the world community. Afghanistan is a member of SAARC, ECO and OIC. It is hoping to join SCO soon to develop closer economic ties with neighboring and regional countries in the so-called New Silk Road trade project. Foreign Minister Zalmai Rassoul told the media in 2011 that his nation's "goal is to achieve an Afghan economy whose growth is based on trade, private enterprise and investment". Experts believe that this will revolutionize the economy of the region. Opium production in Afghanistan soared to a record in 2007 with about 3 million people reported to be involved in the business but then declined significantly in the years following. The government started programs to help reduce cultivation of poppy, and by 2010 it was reported that 24 out of the 34 provinces were free from poppy grow. In June 2012, India strongly advocated for private investments in the resource rich country and creation of suitable environment therefor. Telecommunication services in the country are provided by Afghan Wireless, Etisalat, Roshan, MTN Group and Afghan Telecom. In 2006, the Afghan Ministry of Communications signed a $64.5 million agreement with ZTE for the establishment of a countrywide optical fiber cable network. As of 2011, Afghanistan has around 17 million GSM phone subscribers and over 1 million internet users. It only has about 75,000 fixed telephone lines and little over 190,000 CDMA subscribers. 3G services are provided by Etisalat and MTN Group. The Afghan government announced that it will send expressions of interest to international companies to attract funding will launch its first ever space satellite by October 2012. It was reported in 2006 that nearly 60% of the population lives within two hours by foot to the nearest health facility, up from 9% in 2002. Latest surveys show that 57% of Afghans say they have good or very good access to clinics or hospitals. The nation also has one of the highest incidences of people with disabilities, with an estimated one million handicapped people. About 80,000 citizens have lost limbs, mainly as a result of landmines. Non-governmental charities such as Save the Children and Mahboba's Promise assist orphans in association with governmental structures. Demographic and Health Surveys is working with the Indian Institute of Health Management Research and others to conduct a survey in Afghanistan focusing on Maternal death, among other things. Education in the country includes K-12 and higher education, which is supervised by the Ministry of Education and the Ministry of Higher Education. The nation's education system was destroyed due to the decades of war, but it began reviving after the Karzai administration came to power in late 2001. More than 5,000 schools were built or renovated, with more than 100,000 teachers being trained and recruited. It was reported in 2011 that more than seven million male and female students were enrolled in schools. As of 2011, about 82,000 students are enrolled in different universities around the country. 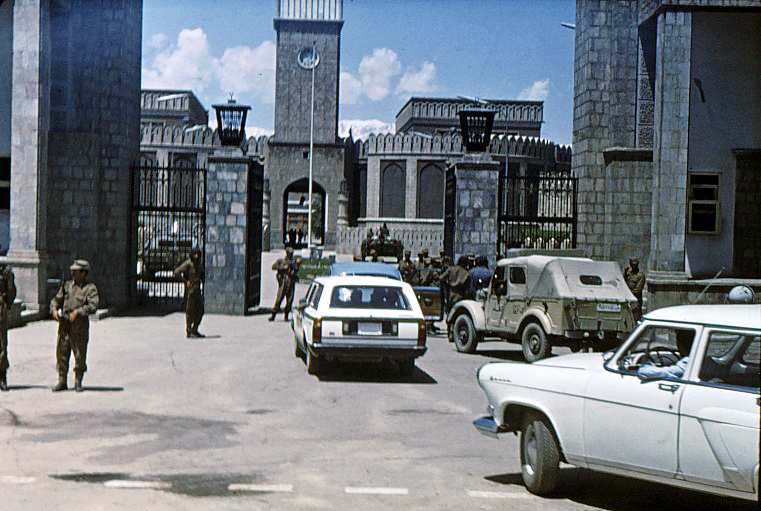 Kabul University reopened in 2002 to both male and female students. In 2006, the American University of Afghanistan was established in Kabul, with the aim of providing a world-class, English-language, co-educational learning environment in Afghanistan. The capital of Kabul serves as the learning center of Afghanistan, with many of the best educational institutions being based there. Major universities outside of Kabul include Kandahar University in the south, Herat University in the northwest, Balkh University in the north, Nangarhar University and Khost University in the eastern zones, as well as a number of others. The National Military Academy of Afghanistan, modeled after the United States Military Academy at West Point, is a four-year military development institution dedicated to graduating officers for the Afghan armed forces. The $200 million Afghan Defense University is under construction near Qargha in Kabul. The United States is building six faculties of education and five provincial teacher training colleges around the country, two large secondary schools in Kabul and one school in Jalalabad. Literacy rate of the entire population is low, around 28%. Female literacy may be as low as 10%. In 2010, the United States began establishing a number of Lincoln learning centers in Afghanistan. They are set up to serve as programming platforms offering English language classes, library facilities, programming venues, Internet connectivity, educational and other counseling services. A goal of the program is to reach at least 4,000 Afghan citizens per month per location. The military and national police are also provided with mandatory literacy courses. In addition to this, Baghch-e-Simsim (based on the American Sesame Street) was launched in late 2011 to help Afghan children learn from preschool and onward. The 2004–present suggested estimations in the above chart are supported by recent national opinion polls, which were aimed at knowing how a group of about 804 to 7,760 local residents in Afghanistan felt about the current war, political situation, as well as the economic and social issues affecting their daily lives. Seven of the surveys were conducted between 2004 to 2012 by the Asia Foundation and one between 2004 to 2009 by a combined effort of the broadcasting companies NBC News, BBC, and ARD. Pashto and Dari (Persian) are the official languages of Afghanistan, making bilingualism very common. Both are Indo-European languages from the Iranian languages sub-family. Persian has always been the prestige language and as the main means of inter-ethnic communication, maintaining its status of lingua franca. It is the native tongue of the Tajiks, Hazaras, Aimaks and Kizilbash. Pashto is the native tongue of the Pashtuns, although many Pashtuns often use Persian and some non-Pashtuns are fluent in Pashto. Other languages, such as Uzbek, Arabic, Turkmen, Balochi, Pashayi and Nuristani languages (Ashkunu, Kamkata-viri, Vasi-vari, Tregami and Kalasha-ala), are used as native tongue by minority groups across the country and have official status in the regions where they are widely spoken. Minor languages also include Pamiri (Shughni, Munji, Ishkashimi and Wakhi), Brahui, Hindko, Kyrgyz, etc. Small percent of Afghans are also fluent in Arabic, Urdu, English, and other languages. Over 99% of the Afghan population is Muslim: approximately 80–85% follow the Sunni sect, 15–19% are Shi'a, and 1% other. Until the 1890s, the region around Nuristan was known as Kafiristan (land of the kafirs) because of its inhabitants: the Nuristanis, an ethnically distinctive people who practiced animism, polytheism and shamanism. Apart from Muslims, there are also small minorities of Christians, Buddhist, Parsi, Sikhs and Hindus. There was also a small Jewish community in Afghanistan who emigrated to Israel and the United States by the end of the last century, and only one individual by the name of Zablon Simintov remains today. The Afghan culture has been around for over two millennia, tracing record to at least the time of the Achaemenid Empire in 500 BCE. It is mostly a nomadic and tribal society, with different regions of the country having their own tradition, reflecting the multi-cultural and multi-lingual character of the nation. In the southern and eastern region the people live according to the Pashtun culture by following Pashtunwali, which is an ancient way of life that is still preserved. The remaining of the country is culturally Persian and Turkic. Some non-Pashtuns who live in close proximity with Pashtuns have adopted Pashtunwali in a process called Pashtunization (or Afghanization) while some Pashtuns have been Persianized. Millions of Afghans who have been living in Pakistan and Iran over the last 30 years have been influenced by the cultures of those neighboring nations. Men wearing their traditional Afghan dress in the southern city of Kandahar. Although literacy level is low, classic Persian and Pashto poetry play an important role in the Afghan culture. Poetry has always been one of the major educational pillars in the region, to the level that it has integrated itself into culture. Some notable poets include Rumi, Rabi'a Balkhi, Sanai, Jami, Khushal Khan Khattak, Rahman Baba, Khalilullah Khalili, and Parween Pazhwak. The city of Kabul has been home to many musicians in the past, who were masters of both traditional and modern Afghan music, especially during the Nowruz (New Year) and National Independence Day celebrations. Ahmad Zahir, Nashenas, Ustad Sarahang, Sarban, Ubaidullah Jan, Farhad Darya, and Naghma are some of the notable Afghan musicians but there are many others. Most Afghans are accustomed to watching Bollywood films from India and listening to its filmi hit songs. Many of the Bollywood film stars have roots in Afghanistan, including Madhubala, Feroz Khan, Kader Khan, Shahrukh Khan, Aamir Khan, Salman Khan, Naseeruddin Shah, Fardeen Khan, Sohail Khan, Celina Jaitley and many others. In addition, several Bollywood films such as Dharmatma, Khuda Gawah, Escape from Taliban and Kabul Express have been shot inside Afghanistan. The Afghanistan national football team has been competing in international football since 1941 and currently has a world ranking of 179. The national team plays its home games at the Ghazi Stadium in Kabul, while football in Afghanistan is governed by the Afghanistan Football Federation. The national team has never competed or qualified for the World Cup. The country also has a national team in the sport of futsal, a 5-a-side variation of football. Cricket, which is a newly introduced sport in Afghanistan fuelled by the success of the Afghan national cricket team is growing in popularity. Afghanistan participated in the 2009 ICC World Cup Qualifier, 2010 ICC World Cricket League Division One, and 2010 ICC World Twenty20 where they played India and South Africa. It won the ACC Twenty20 Cup in 2007, 2009, and 2011. More recently the under-19 team played in the 2012 ICC Under-19 Cricket World Cup. The Afghanistan Cricket Board (ACB) is the official governing body of the sport and is headquartered in Kabul. The Ghazi Amanullah Khan International Cricket Stadium serves as the nation's main cricket stadium, followed by the Kabul National Cricket Stadium. Several other stadiums are under construction. Domestically, cricket is played between teams from different provinces. Some of the other popular sports in Afghanistan include basketball, vollyball, taekwondo, and bodybuilding. Buzkashi is a traditional sport, mainly among the northern Afghans. It is similar to polo, played by horsemen in two teams, each trying to grab and hold a goat carcass. Afghan Hounds (a type of running dog) originated in Afghanistan and was originally used in the sport of hunting. a. ^ Other terms that have been used as demonyms are Afghani and Afghanistani. ^ a b "Article Sixteen of the 2004 Constitution of Afghanistan". 2004. http://www.afghan-web.com/politics/current_constitution.html#preamble. Retrieved June 13, 2012. "From among the languages of Pashto, Dari, Uzbeki, Turkmani, Baluchi, Pashai, Nuristani, Pamiri (alsana), Arab and other languages spoken in the country, Pashto and Dari are the official languages of the state." ^ a b c d e f "Afghanistan". The World Factbook. Central Intelligence Agency (CIA). https://www.cia.gov/library/publications/the-world-factbook/geos/af.html. Retrieved 2012-12-14. ^ a b "Last Afghan empire". Louis Dupree, Nancy Hatch Dupree and others. Encyclopædia Britannica Online. http://www.britannica.com/EBchecked/topic/7798/Afghanistan/21392/Last-Afghan-empire. Retrieved 22 August 2010. ^ "Chapter 2. The Society and Its Environment" (PDF). Afghanistan Country Study. Illinois Institute of Technology. pp. 105–06. http://www.gl.iit.edu/govdocs/afghanistan/Afghanistan-Chapter2.pdf. Retrieved 12 October 2010. ^ a b c "Afghanistan". International Monetary Fund. http://www.imf.org/external/pubs/ft/weo/2012/01/weodata/weorept.aspx?sy=2009&ey=2012&scsm=1&ssd=1&sort=country&ds=.&br=1&c=512&s=NGDPD%2CNGDPDPC%2CPPPGDP%2CPPPPC%2CLP&grp=0&a=&pr.x=80&pr.y=10. Retrieved 17 April 2012. ^ "Human Development Index and its components" (PDF). http://hdr.undp.org/en/media/HDR_2011_EN_Table1.pdf. Retrieved 19 May 2012. ^ a b "Composition of macro geographical (continental) regions, geographical sub-regions, and selected economic and other groupings". UNdata. 26 April 2011. Archived from the original on 13 July 2011. http://millenniumindicators.un.org/unsd/methods/m49/m49regin.htm#asia. Retrieved 13 July 2011. ^ a b "Afghanistan". Encyclopædia Britannica. Archived from the original on 25 February 2010. http://www.britannica.com/EBchecked/topic/7798/Afghanistan. Retrieved 17 March 2010. ^ a b Griffin, Luke (14 January 2002). "The Pre-Islamic Period". Afghanistan Country Study. Illinois Institute of Technology. http://www.gl.iit.edu/govdocs/afghanistan/PreIslamic.html. Retrieved 14 October 2010. ^ a b "Afghanistan country profile". BBC News. 12 January 2012. Archived from the original on 5 November 2010. http://web.archive.org/web/20101105203012/http://news.bbc.co.uk/2/hi/south_asia/country_profiles/1162668.stm. Retrieved 19 May 2012. ^ Baxter, Craig (1997). "Chapter 1. Historical Setting". Library of Congress Country Studies on Afghanistan. http://lcweb2.loc.gov/cgi-bin/query/r?frd/cstdy:@field(DOCID%2Baf0001). Retrieved 24 June 2010. ^ "Kingdoms of South Asia – Afghanistan in Far East Kingdoms: Persia and the East". The History Files. 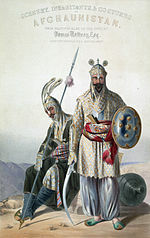 http://www.historyfiles.co.uk/KingListsMiddEast/EasternAfghans.htm. Retrieved 24 June 2010. ^ D. Balland (2010). "Afghanistan x. Political History". Encyclopædia Iranica (online ed.). Columbia University. http://iranicaonline.org/articles/afghanistan-x-political-history. ^ M. Longworth Dames, G. Morgenstierne, and R. Ghirshman (1999). "AFGHĀNISTĀN". Encyclopaedia of Islam (CD-ROM v. 1.0 ed.). Koninklijke Brill NV. ^ "President Dwight D. Eisenhower inspects the honor guard upon arr at Bagram Airport". Meridian.org. http://www.meridian.org/insmallthingsremembered/president-dwight-d-eisenhower-inspects-the-honor-guard-upon-arrival-at-bagram-airport. Retrieved 6 May 2012. ^ a b "Soldiers of God: Cold War (Part 1/5)". CNN. 1998. http://www.youtube.com/watch?v=vYUzL1qhltA&feature=related. Retrieved 11 October 2011. ^ "Afghanistan". Berkley Center for Religion, Peace, and World Affairs. http://berkleycenter.georgetown.edu/resources/countries/afghanistan. Retrieved 1 December 2011. ^ "United Nations Security Council" (PDF). United Nations. Naval Postgraduate School. 5 December 2001. http://www.nps.edu/Academics/centers/ccc/publications/OnlineJournal/2006/Feb/johnsonFeb06-figure1-bonnagreement.pdf. Retrieved 6 October 2010. ^ Olson, Parmy (14 January 2010). "The World's Most Dangerous Countries". Forbes. http://www.forbes.com/2010/01/14/most-dangerous-countries-lifestyle-travel-haiti-afghanistan-iraq.html. Retrieved 26 February 2012. ^ "Pakistan/Afghanistan". Gulf-times.com. 27 February 2012. http://www.gulf-times.com/site/topics/article.asp?cu_no=2&item_no=489081&version=1&template_id=41&parent_id=23. Retrieved 6 May 2012. ^ a b c "U.S. blames Pakistan agency in Kabul attack". Reuters. 22 September 2011. http://news.yahoo.com/pakistan-isi-urged-attacks-u-targets-officials-002201562.html. Retrieved 22 September 2011. ^ a b "President Karzai Address to the Nation on Afghanistan's Peace Efforts". The Embassy of Afghanistan in Washington, DC. http://www.embassyofafghanistan.org/PresidentKarzaiAddresstotheNationonPeaceEfforts.htm. Retrieved 10 October 2011. ^ a b "Citing rising death toll, UN urges better protection of Afghan civilians". United Nations Assistance Mission in Afghanistan. 9 March 2011. http://unama.unmissions.org/Default.aspx?tabid=1783&ctl=Details&mid=1882&ItemID=12602. ^ Afghan civilian casualties haunt U.N.
^ Cowan, William and Jaromira Rakušan. Source Book for Linguistics. 3rd ed. John Benjamins, 1998. ^ Banting, Erinn (2003). Afghanistan: The land. Crabtree Publishing Company. pp. 4, 32. ISBN 0-7787-9335-4. http://books.google.com/books?id=KRt0HfYFZGsC&lpg=PP1&vq=place%20of%20Afghans&pg=PA4#v=onepage&q&f=false. ^ a b c Ch. M. Kieffer (15 December 1983). "Afghan". Encyclopædia Iranica (online ed.). Columbia University. http://www.iranicaonline.org/articles/afgan-in-current-political-usage-any-citizen-of-afghanistan-whatever-his-ethnic-tribal-or-religious-affiliation. ^ "History of Afghanistan". Encyclopædia Britannica Online. http://www.britannica.com/EBchecked/topic/7798/Afghanistan/129450/History?anchor=ref261360. Retrieved 22 November 2010. ^ Vogelsang, Willem (2002). The Afghans. Wiley-Blackwell. p. 382. ISBN 0-631-19841-5. http://books.google.com/books?id=9kfJ6MlMsJQC&lpg=PP1&pg=PA18#v=onepage&q&f=false. ^ Morgenstierne, G. (1999). "AFGHĀN". Encyclopaedia of Islam (CD-ROM v. 1.0 ed.). Koninklijke Brill NV. ^ a b c Ibn Battuta (2004). Travels in Asia and Africa, 1325–1354 (reprint, illustrated ed.). Routledge. p. 416. ISBN 0-415-34473-5. http://books.google.com/books?id=zKqn_CWTxYEC&lpg=PP1&pg=PA180#v=onepage&q&f=false. ^ a b Muhammad Qasim Hindu Shah (1560). "The History of India". Sir H. M. Elliot. London: Packard Humanities Institute. p. 8. http://persian.packhum.org/persian/pf?file=80201016&ct=199. Retrieved 22 August 2010. ^ Extract from "Passion of the Afghan" by Khushal Khan Khattak; translated by C. Biddulph in Afghan Poetry Of The 17th Century: Selections from the Poems of Khushal Khan Khattak, London, 1890. ^ Zahir ud-Din Mohammad Babur (1525). "Events Of The Year 910". Memoirs of Babur. Packard Humanities Institute. http://persian.packhum.org/persian//pf?file=03501051&ct=92. Retrieved 22 August 2010. ^ a b Friedrich Engels (1857). "Afghanistan". Andy Blunden. The New American Cyclopaedia, Vol. I. http://www.marxists.org/archive/marx/works/1857/afghanistan/index.htm. Retrieved 25 August 2010. ^ Elphinstone, M., "Account of the Kingdom of Cabul and its Dependencies in Persia and India", 1815; published by Longman, Hurst, Rees, Orme & Brown. ^ M. Ali, "Afghanistan: The War of Independence, 1919", 1960. ^ "Location: Southern Asia, north and west of Pakistan, east of Iran". The World Factbook. CIA. https://www.cia.gov/library/publications/the-world-factbook/fields/2144.html#af. Retrieved 24 June 2010. ^ "U.S. maps". Pubs.usgs.gov. http://pubs.usgs.gov/of/1997/ofr-97-470/OF97-470C/asiaGmap.html. Retrieved 19 May 2012. ^ "History of Environmental Change in the Sistan Basin 1976–2005". Archived from the original on 7 August 2007. http://postconflict.unep.ch/publications/sistan.pdf. Retrieved 20 July 2007. ^ "Snow in Afghanistan: Natural Hazards". NASA. 3 February 2006. http://earthobservatory.nasa.gov/NaturalHazards/view.php?id=16066. Retrieved 6 May 2012. ^ "Snow may end Afghan drought, but bitter winter looms". Reuters. 18 January 2012. http://in.reuters.com/article/2012/01/18/afghanistan-snow-idINDEE80H0BR20120118. ^ "Afghanistan's woeful water management delights neighbors". Csmonitor.com. 15 June 2010. Archived from the original on 14 November 2010. http://www.csmonitor.com/World/Asia-South-Central/2010/0615/Afghanistan-s-woeful-water-management-delights-neighbors. Retrieved 14 November 2010. ^ Crone, Anthony J. (April 2007). ﻿Earthquakes Pose a Serious Hazard in Afghanistan﻿ (Report). US Geological Survey. Fact Sheet FS 2007–3027. http://pubs.usgs.gov/fs/2007/3027/pdf/FS07-3027_508.pdf. Retrieved 14 October 2011. ^ "Earthquake Hazards". 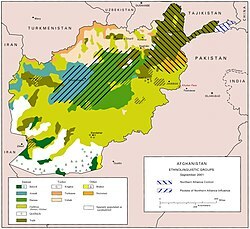 USGS Projects in Afghanistan. US Geological Survey. 1 August 2011. http://afghanistan.cr.usgs.gov/earthquake-hazards. Retrieved 13 October 2011. ^ "'Seven dead' as earthquake rocks Afghanistan". BBC News. 19 April 2010. http://news.bbc.co.uk/2/hi/8628901.stm. Retrieved 13 October 2011. ^ a b Peters, Steven G.; et al. (October 2007). ﻿Preliminary Assessment of Non-Fuel Mineral Resources of Afghanistan, 2007﻿ (Report). USGS Afghanistan Project/US Geological Survey/Afghanistan Geological Survey. Fact Sheet 2007–3063. http://pubs.usgs.gov/fs/2007/3063/fs2007-3063.pdf. Retrieved 13 October 2011. ^ a b "Minerals in Afghanistan". British Geological Survey. http://www.bgs.ac.uk/AfghanMinerals/docs/Gold_A4.pdf#search='gold%20and%20copper%20discovered%20in%20afghanistan'. Retrieved 4 December 2010. ^ a b "Afghanistan's untapped minerals 'worth $3 trillion'". The Independent (London). 18 June 2010. http://www.independent.co.uk/news/world/asia/afghanistans-untapped-minerals-worth-3-trillion-2003616.html. Retrieved 15 October 2011. ^ a b c Risen, James (17 June 2010). "U.S. Identifies Vast Riches of Minerals in Afghanistan". The New York Times. Archived from the original on 15 November 2010. http://web.archive.org/web/20101115222457/http://www.nytimes.com/2010/06/14/world/asia/14minerals.html?hp. Retrieved 14 November 2010. ^ a b "Afghans say US team found huge potential mineral wealth". BBC News. 14 June 2010. http://www.bbc.co.uk/news/10311752. Retrieved 13 October 2011. ^ "Land area (sq. km)". World Development Indicators. World Bank. 2011. http://data.worldbank.org/indicator/AG.LND.TOTL.K2. Retrieved 13 October 2011. ^ "CIA Factbook – Area: 41". CIA. 26 November 1991. https://www.cia.gov/library/publications/the-world-factbook/fields/2147.html#af. Retrieved 4 February 2012. ^ a b c d "Afghanistan – John Ford Shroder, University of Nebraska". Webcitation.org. http://www.webcitation.org/5kwDUj6WJ. Retrieved 19 May 2012. ^ "Afghanistan: A Treasure Trove for Archaeologists". Time Magazine. 26 February 2009. http://www.time.com/time/magazine/article/0,9171,1881896-1,00.html. Retrieved 13 July 2011. ^ Bryant, Edwin F. (2001) The quest for the origins of Vedic culture: the Indo-Aryan migration debate Oxford University Press, ISBN 0-19-513777-9. ^ "Chronological History of Afghanistan – the cradle of Gandharan civilisation". Gandhara.com.au. 15 February 1989. http://www.gandhara.com.au/afghan_table.html. Retrieved 19 May 2012. ^ "''Afghanistan: Achaemenid dynasty rule'', Ancient Classical History". Ancienthistory.about.com. 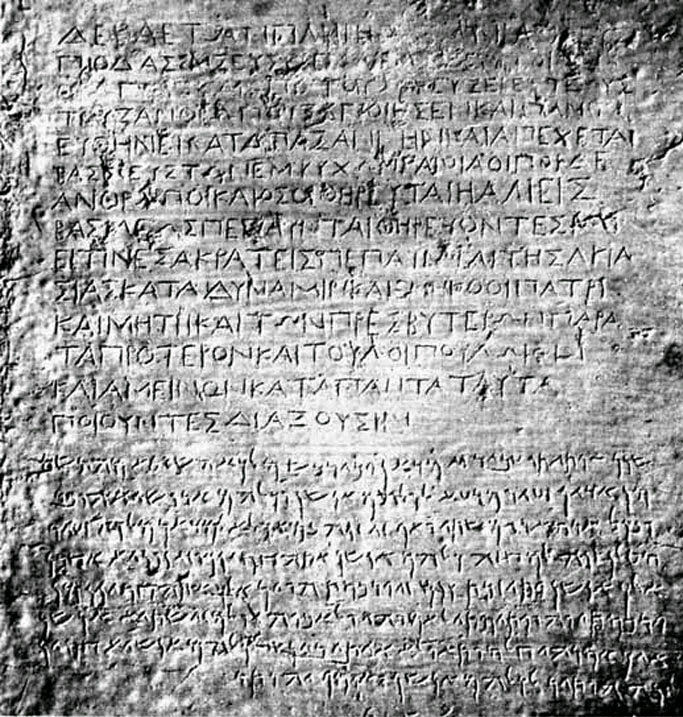 13 April 2012. http://ancienthistory.about.com/library/bl/bl_afghanachaemenid.htm. Retrieved 19 May 2012. ^ Nancy Hatch Dupree / Aḥmad ʻAlī Kuhzād (1972). "An Historical Guide to Kabul – The Name". American International School of Kabul. Archived from the original on 30 August 2010. http://www.aisk.org/aisk/NHDAHGTK05.php. Retrieved September 18, 2010. ^ a b c d "Country Profile: Afghanistan". Library of Congress Country Studies on Afghanistan. August 2008. http://lcweb2.loc.gov/frd/cs/profiles/Afghanistan.pdf. Retrieved 10 October 2010. ^ Dani, A. H. and B. A. Litvinsky. "The Kushano-Sasanian Kingdom". In: History of civilizations of Central Asia, Volume III. The crossroads of civilizations: A.D. 250 to 750. Litvinsky, B.A., ed., 1996. UNESCO Publishing, pp. 103–118. ISBN 92-3-103211-9. ^ Zeimal, E. V. "The Kidarite Kingdom in Central Asia". In: History of civilizations of Central Asia, Volume III. The crossroads of civilizations: A.D. 250 to 750. Litvinsky, B.A., ed., 1996, UNESCO Publishing, pp. 119–133. ISBN 92-3-103211-9. ^ Litvinsky, B. A. "The Hephthalite Empire". In: History of civilizations of Central Asia, Volume III. The crossroads of civilizations: A.D. 250 to 750. Litvinsky, B.A., ed., 1996, UNESCO Publishing, pp. 135–162. ISBN 92-3-103211-9. ^ "Khorasan". Encyclopædia Britannica Online. Archived from the original on 3 October 2010. http://www.britannica.com/EBchecked/topic/316850/Khorasan. Retrieved 21 October 2010. ^ "Khurasan". The Encyclopaedia of Islam. Brill. 2009. p. 55. http://books.google.com/books?id=cJQ3AAAAIAAJ&printsec=frontcover#v=onepage&q&f=false. "In pre-Islamic and early Islamic times, the term "Khurassan" frequently had a much wider denotation, covering also parts of what are now Soviet Central Asia and Afghanistan"
^ Zahir ud-Din Mohammad Babur (1525). "Events Of The Year 910 (p.4)". Memoirs of Babur. Packard Humanities Institute. http://persian.packhum.org/persian//pf?file=03501051&ct=91. Retrieved 22 August 2010. ^ "A.—The Hindu Kings of Kábul". Sir H. M. Elliot. London: Packard Humanities Institute. 1867–1877. http://persian.packhum.org/persian/pf?file=80201012&ct=98. Retrieved 18 September 2010. ^ ?amd-Allah Mustawfi of Qazwin (1340). "The Geographical Part of the NUZHAT-AL-QULUB". Translated by Guy Le Strange. Packard Humanities Institute. http://persian.packhum.org/persian/pf?file=16301012&ct=16. Retrieved 19 August 2011. ^ ""Ghaznavid Dynaty", History of Iran, Iran Chamber Society". Iranchamber.com. Archived from the original on 24 November 2010. http://www.iranchamber.com/history/ghaznavids/ghaznavids.php. Retrieved 14 November 2010. ^ "Central Asian world cities". Faculty.washington.edu. 29 September 2007. https://faculty.washington.edu/modelski/CAWC.htm. Retrieved 6 May 2012. ^ Page, Susan (18 February 2009). "Obama's war: Deploying 17,000 raises stakes in Afghanistan". Usatoday.com. http://www.usatoday.com/news/world/2009-02-17-afghanistan-forces_N.htm. Retrieved 19 May 2012. ^ "Timurid Dynasty". Britannica.com. http://www.britannica.com/eb/article-9072546/Timurid-Dynasty. Retrieved 19 May 2012. ^ Otfinoski, Steven (2004). Afghanistan. Infobase Publishing. pp. 8, 130. ISBN 0-8160-5056-2. http://books.google.com/books?id=fbXmk-EauHIC&lpg=PP1&pg=PA8#v=onepage&q&f=false. ^ a b Edward G. Browne. "A Literary History of Persia, Volume 4: Modern Times (1500–1924), Chapter IV. An Outline Of The History Of Persia During The Last Two Centuries (A.D. 1722–1922)". Packard Humanities Institute. http://persian.packhum.org/persian/main?url=pf%3Ffile%3D90001014%26ct%3D29. Retrieved 9 September 2010. ^ "The Hotakis". Encyclopædia Britannica Online. http://www.britannica.com/EBchecked/topic/7798/Afghanistan/21396/The-Durrani-dynasty?anchor=ref306642. Retrieved 9 September 2010. ^ "The Durrani dynasty". Encyclopædia Britannica Online. http://www.britannica.com/EBchecked/topic/7798/Afghanistan/21396/The-Durrani-dynasty?anchor=ref306642. Retrieved 9 September 2010. ^ "History of Iran: Afsharid Dynasty (Nader Shah)". Iranchamber.com. Archived from the original on 24 November 2010. http://www.iranchamber.com/history/afsharids/afsharids.php. Retrieved 14 November 2010. ^ "Background: Afghanistan". The World Factbook. CIA. https://www.cia.gov/library/publications/the-world-factbook/fields/2028.html?countryName=Afghanistan&countryCode=af&regionCode=sas&#af. Retrieved 24 June 2010. ^ "Ahmad Shah and the Durrani Empire". Library of Congress Country Studies on Afghanistan. 1997. http://lcweb2.loc.gov/cgi-bin/query/r?frd/cstdy:@field(DOCID+af0010). Retrieved 25 August 2010. ^ "Ahmad Shah Durrani". Encyclopædia Britannica Online. http://www.britannica.com/EBchecked/topic/10162/Ahmad-Shah-Durrani. Retrieved 9 September 2010. ^ Tanner, Stephen (2009). Afghanistan: A Military History from Alexander the Great to the War against the Taliban. Da Capo Press. p. 126. ISBN 978-0-306-81826-4. http://books.google.com/books?id=J3pUS_-uD-oC&printsec=frontcover#v=onepage&q&f=false. ^ Nalwa, Vanit (2009). Hari Singh Nalwa, "champion of the Khalsaji" (1791–1837). p. 198. http://books.google.com/books?id=ULhgNexD92QC&lpg=PA132&pg=PA198#v=onepage&q&f=false. ^ Chahryar, Adle (2003). History of Civilizations of Central Asia: Development in contrast: from the sixteenth to the mid-nineteenth century. UNESCO. p. 296. ISBN 92-3-103876-1. http://books.google.com/books?id=AzG5llo3YCMC&lpg=PA2&pg=PA296&redir_esc=y#v=onepage&q&f=false. ^ Hafizullah, Emadi (2005). Culture and customs of Afghanistan. Greenwood Publishing Group. p. 252. ISBN 0-313-33089-1. http://books.google.com/books?id=bY8ck6iktikC&lpg=PP1&pg=PA35#v=onepage&q&f=false. ^ Hussain, Rizwan (2005). Pakistan And The Emergence Of Islamic Militancy In Afghanistan. Ashgate Publishing. pp. 108–109. ISBN 0-7546-4434-0. ^ Meher, Jagmohan (2004). America's Afghanistan War: The Success that Failed. Gyan Books. pp. 68–69, 94. ISBN 81-7835-262-1. ^ a b "Afghanistan". Library of Congress Country Studies. http://lcweb2.loc.gov/cgi-bin/query/r?frd/cstdy:@field(DOCID+af0028). Retrieved 14 November 2010. ^ "Landmines in Afghanistan: A Decades Old Danger". Defenseindustrydaily.com. 1 February 2010. http://www.defenseindustrydaily.com/Landmines-in-Afghanistan-A-Decades-Old-Danger-06143/. Retrieved 6 May 2012. ^ "Afghanistan: History – ''Columbia Encyclopedia''". Infoplease.com. 11 September 2001. http://www.infoplease.com/ce6/world/A0856490.html. Retrieved 19 May 2012. ^ a b c d e "II. BACKGROUND". Human Rights Watch. http://www.hrw.org/reports98/afghan/Afrepor0-01.htm#P81_13959. ^ a b "BBC Newsnight 1995". Youtube.com. http://www.youtube.com/watch?v=Jnia-TUuCDs. Retrieved 4 February 2012. ^ a b c d Marcela Grad. Massoud: An Intimate Portrait of the Legendary Afghan Leader (1 March 2009 ed.). Webster University Press. p. 310. ^ a b c d e Newsday (October 2001). "Taliban massacres outlined for UN". Chicago Tribune. http://articles.chicagotribune.com/2001-10-12/news/0110120312_1_taliban-fighters-massacres-in-recent-years-mullah-mohammed-omar. ^ a b c d e Newsday (2001). "Confidential UN report details mass killings of civilian villagers". newsday.org. http://www.papillonsartpalace.com/massacre.htm. Retrieved 12 October 2001. ^ "Incitement of violence against Hazaras by Governor Niazi". Afghanistan: the massacre in Mazar-I-Sharif. Human Rights Watch. November 1998. Archived from the original on 15 December 2007. http://www.hrw.org/reports98/afghan/Afrepor0-03.htm#P186_38364. Retrieved 27 December 2007. ^ a b c d "Afghanistan resistance leader feared dead in blast". The Telegraph (London). 11 September 2001. http://www.telegraph.co.uk/news/worldnews/asia/afghanistan/1340244/Afghanistan-resistance-leader-feared-dead-in-blast.html. ^ "Ahmed Shah Massoud". History Commons. 2010. http://www.historycommons.org/entity.jsp?entity=ahmed_shah_massoud. ^ Marcela Grad (1 March 2009). Massoud: An Intimate Portrait of the Legendary Afghan Leader. Webster University Press. p. 310. ^ "Human Rights Watch Backgrounder, October 2001". Human Rights Watch. 2001. http://www.hrw.org/backgrounder/asia/afghan-bck1005.htm#uf. ^ Rory McCarthy in Islamabad. "New offer on Bin Laden". Guardian. http://www.guardian.co.uk/world/2001/oct/17/afghanistan.terrorism11. Retrieved 17 July 2012. ^ "Bin Laden urges Europe to quit Afghanistan". Reuters. November 29, 2007. http://uk.reuters.com/article/topNews/idUKL2912911920071129?pageNumber=2&virtualBrandChannel=0. ^ Tyler, Patrick (8 October 2001). "A Nation challenged: The attack; U.S. and Britain strike Afghanistan, aiming at bases and terrorist camps; Bush warns 'Taliban will pay a price'". New York Times. http://www.nytimes.com/2001/10/08/world/nation-challenged-attack-us-britain-strike-afghanistan-aiming-bases-terrorist.html?scp=2&sq=Afghanistan+&st=nyt. Retrieved 28 February 2010. ^ "United States Mission to Afghanistan". Nato.usmission.gov. Archived from the original on 21 October 2010. http://nato.usmission.gov/. Retrieved 14 November 2010. ^ Julie Fossler. "USAID Afghanistan". Afghanistan.usaid.gov. Archived from the original on 17 October 2010. http://afghanistan.usaid.gov/en/index.aspx. Retrieved 14 November 2010. ^ "Canada's Engagement in Afghanistan: Backgrounder". Afghanistan.gc.ca. 9 July 2010. http://www.afghanistan.gc.ca/canada-afghanistan/news-nouvelles/2010/2010_07_09.aspx?lang=eng. Retrieved 14 November 2010. ^ Witte, Griff (8 December 2009). "Taliban shadow officials offer concrete alternative". The Washington Post. http://www.washingtonpost.com/wp-dyn/content/article/2009/12/07/AR2009120704127.html. Retrieved 30 March 2010. ^ "Photo Gallery: The 'Kill Team' in Afghanistan". Der Spiegel. 21 March 2010. http://www.spiegel.de/fotostrecke/fotostrecke-65981.html. Retrieved 17 October 2011. ^ Trofimov, Yaroslav (11 September 2010). "Karzai Divides Afghanistan in Reaching Out to Taliban". The Wall Street Journal. Archived from the original on 12 September 2010. http://web.archive.org/web/20100912162856/http://online.wsj.com/article/SB10001424052748703720004575476913015061570.html. Retrieved 11 September 2010. ^ Starkey, Jerome (30 September 2010). "Karzai's Taleban talks raise spectre of civil war warns former spy chief". The Scotsman (Edinburgh). http://news.scotsman.com/world/Karzai39s-Taleban-talks-raise-spectre.6557817.jp. ^ "Abdullah Abdullah: Talks With Taliban Futile". National Public Radio (NPR). 22 October 2010. http://www.npr.org/templates/story/story.php?storyId=130757482. ^ "Germany begins deportations of Afghan refugees". wsws.org. 25 June 2005. http://www.wsws.org/articles/2005/jun2005/afgh-j25.shtml. Retrieved 2 October 2011. ^ "Living in Fear of Deportation". DW-World.De. 22 January 2006. http://www.dw-world.de/dw/article/0,,1862149,00.html. Retrieved 2 October 2011. ^ "Pakistan Accused of Helping Taliban". ABC News. 31 July 2008. http://abcnews.go.com/Video/video?id=5484891&tab=9482931&section=8865284&page=1. Retrieved 28 September 2010. ^ Crilly, Rob; Spillius, Alex (26 July 2010). "Wikileaks: Pakistan accused of helping Taliban in Afghanistan attacks". The Telegraph (London). http://www.telegraph.co.uk/news/worldnews/asia/afghanistan/7910687/Wikileaks-Pakistan-accused-of-helping-Taliban-in-Afghanistan-attacks.html. Retrieved 28 September 2010. ^ "UN: Taliban Responsible for 76% of Deaths in Afghanistan". The Weekly Standard. 10 August 2010. http://www.weeklystandard.com/blogs/taliban-responsible-76-deaths-afghanistan-un. ^ Haddon, Katherine (6 October 2011). "Afghanistan marks 10 years since war started". AFP. http://news.yahoo.com/afghanistan-marks-10-years-since-war-started-211711851.html. Retrieved 6 October 2011. ^ Damien Pearse and agencies (4 February 2012). "Afghan civilian death toll reaches record high | World news | guardian.co.uk". London: Guardian. http://www.guardian.co.uk/world/2012/feb/04/afghan-civilian-death-toll-record. Retrieved 4 February 2012. ^ "Ahmad Zia Massoud, ANF: If Taliban Imposed, There will be Resistance". Outlook Afghanistan. http://www.outlookafghanistan.net/news?post_id=3175. Retrieved 2012-05-06. ^ "Panetta: U.S. will pursue Pakistan-based militants". USA Today. September 2011. http://www.usatoday.com/news/washington/story/2011-09-15/panetta-pakistan/50410770/1?csp=34news. Retrieved 21 September 2011. ^ "Pakistan condemns US comments about spy agency". Associated Press. September 23, 2011. http://news.yahoo.com/pakistan-condemns-us-comments-spy-agency-044440789.html;_ylt=A2KJ3vVYX3xOdRkA9EZXNyoA?rnd=005681253004174930714413. Retrieved September 23, 2011. ^ "U.S. links Pakistan to group it blames for Kabul attack". Reuters. 17 September 2011. http://www.reuters.com/article/2011/09/17/us-pakistan-usa-haqqani-idUSTRE78G1RM20110917. Retrieved 21 September 2011. ^ "Clinton Presses Pakistan to Help Fight Haqqani Insurgent Group". Fox News. 18 September 2011. http://www.foxnews.com/world/2011/09/18/clinton-presses-pakistan-to-help-fight-haqqani-insurgent-group/. Retrieved 21 September 2011. ^ "Push launched against Haqqanis in border areas". Pajhwok.com. 18 October 2011. http://www.pajhwok.com/en/2011/10/18/push-launched-against-haqqanis-border-areas. Retrieved 4 February 2012. ^ "There is more to peace than Taliban". Asia Times. 12 January 2012. http://www.atimes.com/atimes/South_Asia/NA12Df01.html. ^ "Rep. Rohrabacher Leads Bipartisan Delegation's Afghanistan Strategy Session With National Front Leaders in Berlin". 9 January 2012. http://rohrabacher.house.gov/News/DocumentSingle.aspx?DocumentID=274226. ^ "New Supreme Court Could Mark Genuine Departure". E-ariana.com. 13 August 2008. http://www.e-ariana.com/ariana/eariana.nsf/allDocs/E78CB0C74F5E7142872571C90048D8BD?OpenDocument. Retrieved 19 May 2012. ^ "Corruption Perceptions Index 2010 Results". Transparency International. 2010. Archived from the original on 1 March 2011. http://www.transparency.org/policy_research/surveys_indices/cpi/2010/results. Retrieved 27 February 2011. ^ "Corruption widespread in Afghanistan, UNODC survey says". UNODC.org. 19 January 2010. http://www.unodc.org/unodc/en/frontpage/2010/January/corruption-widespread-in-afghanistan-unodc-survey-says.html. Retrieved 14 November 2010. ^ "Karzai vows to tackle corruption". Business.maktoob.com. 9 November 2009. http://business.maktoob.com/20090000393686/Karzai_vows_to_tackle_corruption/Article.htm. Retrieved 14 November 2010. ^ Miller, Greg (10 September 2010). "U.S. effort to help Afghanistan fight corruption has complicated ties". The Washington Post. http://www.washingtonpost.com/wp-dyn/content/article/2010/09/09/AR2010090906828.html. Retrieved 26 September 2011. ^ "Kabul bank scandal: US seeks action". Pajhwok.com. 10 November 2011. http://www.pajhwok.com/en/2011/11/10/kabul-bank-scandal-us-seeks-action. Retrieved 4 February 2012. ^ McDonald, Charlotte (10 September 2009). "Afghan commission orders first ballots invalidated". Google. http://www.google.com/hostednews/afp/article/ALeqM5i3xqZSi2U_mgENDm3TK0-yqI7I_g. Retrieved 14 November 2010. ^ a b Cooper, Helene (2 November 2009). "Karzai Gets New Term as Afghan Runoff is Scrapped". Nytimes.com. http://www.nytimes.com/2009/11/03/world/asia/03afghan.html?_r=1&hp. Retrieved 4 February 2012. ^ Siddique, Abubakar (20 August 2009). "Mixed Turnout, Violence Seen On Afghan Election Day, As Vote Count Begins". GlobalSecurity.org. Archived from the original on 28 December 2009. http://www.globalsecurity.org/military/library/news/2009/08/mil-090820-rferl02.htm. Retrieved 24 December 2009. ^ "RAWA Photo Gallery: They are Responsible for Afghanistan's Tragedy". RAWA. Archived from the original on 19 October 2010. http://www.rawa.org/temp/runews/rawagallery.php?mghash=dc96d38caecd6694eb17fc894bb73212&mggal=2. Retrieved 11 October 2010. ^ "Women in Parliaments: World Classification". Ipu.org. 30 November 2009. http://www.ipu.org/wmn-e/classif.htm. Retrieved 29 December 2009. ^ "Kabul residents to get computerised ID cards in 5 months". Pajhwok Afghan News. 18 September 2011. http://www.pajhwok.com/en/2011/09/08/kabul-residents-get-computerised-id-cards-5-months. Retrieved 19 May 2012. ^ "Explaining Elections, Independent Election Commission of Afghanistan". Iec.org.af. 9 October 2004. http://www.iec.org.af/eng/content.php?id=5&cnid=24. Retrieved 4 February 2012. ^ "Afghan officials accuse Pakistan of embassy attack". Hurriyet. http://www.hurriyet.com.tr/english/world/9387172.asp?gid=244&sz=48187. Retrieved 13 July 2011. ^ "Iran, Pakistan out to weaken Afghanistan, MPs told". Pajhwok Afghan News. May 20, 2012. http://www.pajhwok.com/en/2012/05/20/iran-pakistan-out-weaken-afghanistan-mps-told. Retrieved May 20, 2012. ^ "World | Pakistan stoking violence in Afghanistan: adviser". Dawn.Com. 15 October 2009. http://www.dawn.com/wps/wcm/connect/dawn-content-library/dawn/news/world/13+pakistan+stoking+violence+in+afghanistan+adviser-za-01. Retrieved 29 December 2009. ^ Yousufzai, Wasim (2 August 2011). "Stable Afghanistan in the interest of region: Zardari". Pajhwok.com. http://www.pajhwok.com/en/2011/08/02/stable-afghanistan-interest-region-zardari. Retrieved 19 May 2012. ^ "What is the Best Route for Supplying Landlocked Afghanistan". Oil Price. 30 January 2012. http://oilprice.com/Geopolitics/Asia/What-is-the-Best-Route-for-Supplying-Landlocked-Afghanistan.html. Retrieved 31 January 2012. ^ "The Security of the Caspian Sea Region". Murad Esenov, Oxford University Press. 2001. http://www.ca-c.org/dataeng/oxford.shtml. Retrieved 31 January 2012. ^ "Engaging regional players in Afghanistan" (PDF). Archived from the original on 19 February 2010. http://www.webcitation.org/5neRkSkWj. Retrieved 14 November 2010. ^ a b "Indian PM Manmohan Singh pledges $500m to Afghanistan". BBC News. 12 May 2011. http://www.bbc.co.uk/news/mobile/world-south-asia-13370637. Retrieved 13 July 2011. ^ "We Need India's Help In Afghanistan". Forbes.com. 23 November 2009. Archived from the original on 2 December 2010. http://web.archive.org/web/20101202062801/http://www.forbes.com/2009/11/23/india-afghanistan-manmohan-singh-opinions-contributors-mumbai.html. Retrieved 14 November 2010. ^ Katy Daigle (4 October 2011). "Afghanistan signs 1st strategic pact with India". Associated Press. News.yahoo.com. http://news.yahoo.com/afghanistan-signs-1st-strategic-pact-india-170409367.html. Retrieved 4 February 2012. ^ Pakistan a twin brother, talks to go on: Karzai. Pajhwok Afghan News. Sujoy Dhar. 5 October 2011. ^ a b Pellerindate, Cheryl (23 May 2011). "Afghan Security Forces Grow in Numbers, Quality". American Forces Press Service. United States Department of Defense. http://www.defense.gov//news/newsarticle.aspx?id=64044. Retrieved 10 July 2011. ^ "For U.S., Vast Challenge To Expand Afghan Forces". NPR. http://www.npr.org/templates/story/story.php?storyId=121559123&ps=cprs. Retrieved 19 May 2012. ^ 16 November 2009 (16 November 2009). "Afghanistan to Form Major Anti-Corruption Unit". voanews.com. Archived from the original on 20 November 2009. http://www1.voanews.com/english/news/a-13-2009-11-16-voa7-70423472.html. Retrieved 29 December 2009. ^ "Public killing of woman draws protest in Afghanistan". 12 July 2012. http://www.thehindu.com/news/international/article3627641.ece. ^ "Afghanistan: Food still unaffordable for millions". IRIN. 12 March 2009. Archived from the original on 27 August 2010. http://www.irinnews.org/Report.aspx?ReportId=83417. Retrieved 11 October 2010. ^ "Agriculture". USAID. http://afghanistan.usaid.gov/en/programs/agriculture#Tab=Description. Retrieved 20 October 2010. ^ Exporting Afghanistan, by P.J. Tobia. 17 November 2009. ^ Gall, Carlotta (7 July 2010). "Afghan Companies Say U.S. Did Not Pay Them". New York Times. http://www.nytimes.com/2010/07/08/world/asia/08contract.html. Retrieved 30 September 2011. ^ "the Kabul New City Official Website". DCDA. http://www.dcda.gov.af/. Retrieved 4 February 2012. ^ "Ghazi Amanullah Khan City". najeebzarab.af. 2009. http://www.najeebzarab.af/town_main.php. Retrieved 15 August 2011. ^ "Case study: Aino Mina". Designmena.com. http://www.designmena.com/portfolio/aino-mina. Retrieved 4 February 2012. ^ A Humane Afghan City? by Ann Marlowe in Forbes 2 September 2009. ^ "Economic Growth". USAID. http://afghanistan.usaid.gov/en/programs/economic_growth#Tab=Description. Retrieved 25 September 2011. ^ "Afghanistan, neighbors unveil 'Silk Road' plan". Reuters. 22 September 2011. http://news.yahoo.com/afghanistan-neighbors-unveil-silk-road-plan-003308692.html. Retrieved 24 September 2011. ^ Declan Walsh. "UN horrified by surge in opium trade in Helmand". Guardian. http://www.guardian.co.uk/afghanistan/story/0,,2157313,00.html. Retrieved 19 May 2012. ^ "Afghan opium production in significant decline". UNDOC. http://www.unodc.org/unodc/en/frontpage/2009/September/afghan-opium-production-in-significant--decline.html. ^ "CEOs should replace generals in Afghanistan: India". 28 June 2012. http://www.indianexpress.com/news/ceos-should-replace-generals-in-afghanistan-india/967880/. ^ Klett, T.R. ; et al. (Mar 2006). ﻿Assessment of Undiscovered Petroleum Resources of Northern Afghanistan, 2006﻿ (Report). USGS-Afghanistan Ministry of Mines & Industry Joint Oil & Gas Resource Assessment Team. Fact Sheet 2006–3031. http://pubs.usgs.gov/fs/2006/3031/pdf/FS-3031.pdf. Retrieved 13 October 2011. ^ "Afghanistan's Mineral Fortune". Institute for Environmental Diplomacy and Security Report. 2011. http://www.uvm.edu/ieds/node/568/. ^ Tucker, Ronald D.; et al. (2011). ﻿Rare Earth Element Mineralogy, Geochemistry, and Preliminary Resource Assessment of the Khanneshin Carbonatite Complex, Helmand Province, Afghanistan﻿ (Report). USGS. Open-File Report 2011-1207. http://pubs.usgs.gov/of/2011/1207/pdf/ofr2011-1207.pdf. Retrieved 13 October 2011. ^ "Afghanistan is suddenly wealthy: US finds $1 trillion in mineral deposits". Ksdk.com. http://www.ksdk.com/news/local/story.aspx?storyid=204154. Retrieved 14 November 2010. ^ Sengupta, Kim (15 June 2010). "Afghanistan's resources could make it the richest mining region on earth". The Independent (London). http://www.independent.co.uk/news/world/asia/afghanistans-resources-could-make-it-the-richest-mining-region-on-earth-2000507.html. Retrieved 14 November 2010. ^ Page, Jeremy; Evans, Michael (15 June 2010). "Taleban zones mineral riches may rival Saudi Arabia says Pentagon". The Times (London). http://business.timesonline.co.uk/tol/business/industry_sectors/natural_resources/article7149696.ece. ^ "Ariana". Flyariana.com. Archived from the original on 23 January 2010. http://flyariana.com/schedules.php#. Retrieved 29 December 2009. ^ Tolo News – Construction on Kabul-Torkham Railway to Start Soon, Ministry of Mines Says, Tamim Shaheer. 18 October 2011. ^ "Statistics". Ministry of Communications (Afghanistan). 2006. http://mcit.gov.af/en. Retrieved 17 January 2012. ^ "Afghanistan Seeks Partners to Launch First Domestic Satellite". Satellite Today. 10 April 2012. http://www.satellitetoday.com/twitter/Afghanistan-Seeks-Partners-to-Launch-First-Domestic-Satellite_38620.html. Retrieved 13 August 2012. ^ "Running Projects – Ministry of Communications and Information Technology". Mcit.gov.af. http://mcit.gov.af/en/Documents?DID=35. Retrieved 13 August 2012. ^ 8 April 2012 16:43 (8 April 2012). "Afghanistan to Launch its First Space Satellite". Tolonews.com. http://www.tolonews.com/en/afghanistan/5858-afghanistan-to-launch-its-first-space-satellite. Retrieved 13 August 2012. ^ "Afghanistan to launch first ever satellite". chinadaily.com.cn. http://www.chinadaily.com.cn/world/2012-04/09/content_15007116.htm. Retrieved 13 August 2012. ^ Shamal, Parwiz (21 April 2012). "Afghanistan's First Satellite". Tolonews.com. http://tolonews.com/en/6:30-report/5969-afghanistans-first-satellite. Retrieved 13 August 2012. ^ Emma Graham-Harrison in Kabul. "Afghanistan announces satellite tender". Guardian. http://www.guardian.co.uk/world/2012/apr/09/afghanistan-satellite. Retrieved 13 August 2012. ^ Tan Ee Lyn (6 May 2008). "Afghan medical college struggles to rise from the ashes". Reuters. Archived from the original on 21 January 2010. http://web.archive.org/web/20100121221039/http://www.reuters.com/article/healthNews/idUSISL1059520080506. Retrieved 29 December 2009. ^ a b Peter, Tom A. (17 December 2011). "Childbirth and maternal health improve in Afghanistan". Christian Science Monitor. http://news.yahoo.com/childbirth-maternal-health-improve-afghanistan-160657704.html. Retrieved 12 January 2012. ^ "Health". United States Agency for International Development (USAID). http://afghanistan.usaid.gov/en/programs/health. Retrieved 20 October 2010. ^ Anne-Marie DiNardo, LPA/PIPOS (31 March 2006). "Empowering Afghanistan's Disabled Population – 31 March 2006". Usaid.gov. http://www.usaid.gov/stories/afghanistan/fp_afghan_disabled.html. Retrieved 19 May 2012. ^ Richard Norton-Taylor (13 February 2008). "Afghanistan's refugee crisis 'ignored'". Guardian. http://www.guardian.co.uk/world/2008/feb/13/afghanistan. Retrieved 19 May 2012. ^ Virginia Haussegger Mahooba's Promise ABC TV 7.30 Report. 2009. ABC.net.au. Retrieved 15 July 2009. ^ "Afghanistan". Measuredhs.com. http://www.measuredhs.com/Where-We-Work/Country-Main.cfm?ctry_id=71. Retrieved 14 November 2010. ^ "Afghanistan's Ministry of Higher Education". Archived from the original on 31 May 2011. http://www.mohe.gov.af/?lang=en&p=home. Retrieved 23 June 2011. ^ a b c d "Education". United States Agency for International Development (USAID). http://afghanistan.usaid.gov/en/programs/education#Tab=Description. Retrieved 11 August 2011. ^ a b "Rising literacy in Afghanistan ensures transition". Army.mil. http://www.army.mil/article/59541/Rising_literacy_in_Afghanistan_ensures_transition/. Retrieved 4 February 2012. ^ "Management and Establishment of Lincoln Learning Centers in Afghanistan". http://photos.state.gov/libraries/afghanistan/231771/PDFs/RFP-Lincoln-Learning-Centers.pdf. Retrieved 19 May 2012. ^ "Ghazni governor signs memorandum for Lincoln Learning Center – War On Terror News". Waronterrornews.typepad.com. 22 September 2010. http://waronterrornews.typepad.com/home/2010/09/ghazni-gov-lincoln-learning-center.html. Retrieved 4 February 2012. ^ "Population of Afghanistan". The World Factbook. CIA. 2010. https://www.cia.gov/library/publications/the-world-factbook/fields/2119.html?countryName=Afghanistan&countryCode=af&regionCode=sas&#af. Retrieved 6 November 2011. ^ "Afghanistan – Population Reference Bureau". Population Reference Bureau. http://www.prb.org/Countries/Afghanistan.aspx. Retrieved 29 December 2009. ^ (2012) "Afghanistan's Ethnic Groups Share a Y-Chromosomal Heritage Structured by Historical Events". PLoS ONE 7 (3). DOI:10.1371/journal.pone.0034288. ^ "The People". Center for Applied Linguistics (CAL). 30 June 2002. http://www.cal.org/co/afghan/apeop.html. Retrieved 8 October 2010. ^ "Ethnic groups". The World Factbook. CIA. https://www.cia.gov/library/publications/the-world-factbook/fields/2075.html?countryName=Afghanistan&countryCode=af&regionCode=sas&#af. Retrieved 18 September 2010. ^ "Afghanistan". The World Factbook/Central Intelligence Agency. University of Missouri. 15 October 1991. Archived from the original on 27 April 2011. http://www.umsl.edu/services/govdocs/wofact90/world12.txt. Retrieved 20 March 2011. ^ "Ethnic divisions". The World Factbook/CIA. University of Missouri. 22 January 1993. http://www.umsl.edu/services/govdocs/wofact92/wf930006.txt. Retrieved 16 October 2010. ^ "Ethnic Groups". Library of Congress Country Studies. 1997. http://lcweb2.loc.gov/cgi-bin/query/r?frd/cstdy:@field(DOCID+af0037). Retrieved 8 October 2010. ^ "Ethnic groups:". The World Factbook/CIA. University of Missouri. 2003. http://www.umsl.edu/services/govdocs/wofact2003/geos/af.html. Retrieved 18 September 2010. "Afghanistan in 2012 – A survey of the Afghan people" (PDF). Kabul, Afghanistan: The Asia Foundation. pp. 181–182. http://www.asiafoundation.org/resources/pdfs/Surveybook2012web1.pdf. Retrieved 2012-11-28. "Appendix 1: Target Demographics 181... Pashtun 40%, Tajik 33%, Uzbek 9%, Hazara 11%, Turkmen 2%, Baloch 1%, Nuristani 1%, Aimak 1%, Arab 2%, Pashaye 1%, Sadat 1%"
"Afghanistan in 2011 – A survey of the Afghan people" (PDF). Kabul, Afghanistan: The Asia Foundation. p. 251. http://asiafoundation.org/resources/pdfs/TAF2011AGSurvey.pdf. Retrieved 2012-11-13. "15. Appendix 3: Interview Questionnaire... D-10. Which ethnic group do you belong to? SINGLE RESPONSE ONLY Pashtun 41%, Tajik 32%, Uzbek 9%, Hazara 11%, Turkmen 2%, Baloch 1%, Nuristani 1%, Aimak 1%, Arab 1%, Sadat 1%"
"Afghanistan in 2010 – A survey of the Afghan people" (PDF). Kabul, Afghanistan: The Asia Foundation. 2010. pp. 225–226. http://asiafoundation.org/resources/pdfs/Afghanistanin2010survey.pdf. Retrieved 2011-03-20. "D-9. Which ethnic group do you belong to? SINGLE RESPONSE ONLY Pashtun 42%, Tajik 31%, Uzbek 9%, Hazara 10%, Turkmen 2%, Baloch 1%, Nuristani 1%, Aimak 2%, Arab 2%"
"Afghanistan in 2009: A Survey of the Afghan People" (PDF). Kabul, Afghanistan: The Asia Foundation. http://www.asiafoundation.org/resources/pdfs/Afghanistanin2009.pdf. Retrieved 2012-11-28. "The 2009 survey interviewed 6,406 Afghans (53% men and 47% women)"
"Afghanistan in 2010 – A survey of the Afghan people" (PDF). Kabul, Afghanistan: The Asia Foundation. http://www.asiafoundation.org/resources/pdfs/Afghanistanin2008.pdf. Retrieved 2012-11-28. "The 2008 survey interviewed 6,593 Afghans..."
"Afghanistan in 2007 – A survey of the Afghan people" (PDF). Kabul, Afghanistan: The Asia Foundation. 2010. pp. 225–226. http://www.asiafoundation.org/resources/pdfs/AGsurvey07.pdf. Retrieved 2011-03-20. "The 2007 survey interviewed 6,406 Afghans, Which ethnic group do you belong to? SINGLE RESPONSE ONLY Pashtun 40%, Tajik 35%, Uzbek 8%, Hazara 10%, Turkmen 3%, Baloch 1%, Nuristani 1%, Aimak 1%, Arab 1%"
"Afghanistan in 2006 – A survey of the Afghan people" (PDF). Kabul, Afghanistan: The Asia Foundation. pp. 83–88. http://www.asiafoundation.org/pdf/AG-survey06.pdf. Retrieved 2012-11-28. "A total of 6,226 respondents were surveyed in the study, out of which 4888 (78.5%) were from the rural areas and 1338 (22%) were from the urban areas. Ethnicity: Pashtun 40.9, Tajik 37.1, Uzbek 9.2, Hazara 9.2, Turkmen 1.7, Baloch 0.5, Nuristani 0.4, Aimak 0.1, Arab 0.7, Pashayi 0.3"
"Afghanistan in 2004 – A survey of the Afghan people" (PDF). Kabul, Afghanistan: The Asia Foundation. 2004. http://www.asiafoundation.org/resources/pdfs/afghanvotered04.pdf. Retrieved 2012-11-28. "The 2004 survey interviewed 804 Afghans, Which ethnic group do you belong to? Pashtun 46%, Tajik 39%, Uzbek 6%, Hazara 6%, Turkmen 1%, Baloch 0%, Nuristani 1%, Aimak 0%, Arab 1%, Pashaye 0%, Other 1%." ^ a b "ABC NEWS/BBC/ARD poll - Afghanistan: Where Things Stand" (PDF). Kabul, Afghanistan: ABC News. pp. 38–40. http://abcnews.go.com/images/PollingUnit/1083a1Afghanistan2009.pdf. Retrieved 2010-10-29. ^ "Population". The World Factbook. CIA. https://www.cia.gov/library/publications/the-world-factbook/fields/2098.html. Retrieved 24 September 2011. ^ "Mapping the Global Muslim Population: A Report on the Size and Distribution of the World's Muslim Population". Pew Research Center. 7 October 2009. Archived from the original on 30 August 2010. http://pewforum.org/Muslim/Mapping-the-Global-Muslim-Population%286%29.aspx. Retrieved 3 September 2010. ^ Miller, Tracy, ed (October 2009). Mapping the Global Muslim Population: A Report on the Size and Distribution of the World's Muslim Population. Pew Research Center. Archived from the original on 5 August 2010. http://pewforum.org/newassets/images/reports/Muslimpopulation/Muslimpopulation.pdf. Retrieved 3 September 2010. ^ "Afghanistan". The World Factbook. https://www.cia.gov/library/publications/the-world-factbook/docs/notesanddefs.html?countryName=Afghanistan&countryCode=af&regionCode=sas#2122. Retrieved 3 September 2010. ^ Klimberg, Max (1 October 2004). "NURISTAN". Encyclopædia Iranica (online ed.). United States: Columbia University. http://www.iranicaonline.org/articles/nuristan. ^ Lavina Melwani, New York. "Hindus Abandon Afghanistan". Hinduism Today. http://www.hinduismtoday.com/archives/1994/4/1994-4-02.shtml. Retrieved 19 May 2012. ^ Majumder, Sanjoy (25 September 2003). "Sikhs struggle in Afghanistan". BBC News. http://news.bbc.co.uk/1/hi/world/south_asia/3138282.stm. Retrieved 19 May 2012. ^ N.C. Aizenman. "Afghan Jew Becomes Country's One and Only". Washingtonpost.com. http://www.washingtonpost.com/wp-dyn/articles/A39702-2005Jan26.html. Retrieved 19 May 2012. ^ "Country Profile: Afghanistan". Library of Congress Country Studies on Afghanistan. August 2008. http://lcweb2.loc.gov/frd/cs/profiles/Afghanistan.pdf. Retrieved 16 August 2010. ^ Barbara Robson, Juliene Lipson, Farid Younos, Mariam Mehdi. "The Afghans – Their History and Culture". United States: Center for Applied Linguistics. 30 June 2002. http://www.cal.org/co/afghan/ahist.html. Retrieved 25 September 2010. ^ Banting, Erinn (2003). Afghanistan: The land. Crabtree Publishing Company. p. 32. ISBN 0-7787-9335-4. http://books.google.com/books?id=KRt0HfYFZGsC&lpg=PP1&vq=place%20of%20Afghans&pg=PA4#v=onepage&q&f=false. ^ "Afghanistan: Kuchi nomads seek a better deal". IRIN Asia. 18 February 2008. ^ "42 Buddhist relics discovered in Logar". Maqsood Azizi. Pajhwok Afghan News. 18 August 2010. http://www.cal.org/co/afghan/ahist.html. Retrieved 23 August 2010. ^ "Afghan archaeologists find Buddhist site as war rages". Sayed Salahuddin. News Daily. 17 August 2010. Archived from the original on 18 August 2010. http://www.newsdaily.com/stories/tre67g1cn-us-afghanistan-buddhist-relics/. Retrieved 16 August 2010. ^ "Buddhist remains found in Afghanistan". Press TV. 17 August 2010. Archived from the original on 20 August 2010. http://www.presstv.ir/detail/139117.html. Retrieved 16 August 2010. ^ "Survey of historical sites in Ghazni launched". Pajhwok Afghan News. 27 August 2011. http://www.pajhwok.com/en/2011/08/27/survey-historical-sites-ghazni-launched. Retrieved 27 August 2011. ^ "Classical Dari and Pashto Poets". Afghan-web.com. http://www.afghan-web.com/culture/poetry/cpoets.html. Retrieved 4 February 2012. ^ "Artist Biographies". Afghanland.com. http://www.afghanland.com/entertainment/music/bio.html. Retrieved 17 October 2011. ^ "Afghans qualify for 2012 U-19 World Cup". Pajhwok Afghan News. pajhwok.com. 9 August 2011. http://www.pajhwok.com/en/2011/08/09/afghans-qualify-2012-u-19-world-cup. Retrieved 14 September 2011. ^ "All provinces to have cricket grounds: minister". Pajhwok Afghan News. pajhwok.com. 11 October 2010. http://www.pajhwok.com/en/2010/10/11/all-provinces-have-cricket-grounds-minister. Retrieved 14 September 2011. ^ "Sports". Pajhwok Afghan News. pajhwok.com. http://www.pajhwok.com/en/sports. Retrieved 14 September 2011. ^ Dictionary.com. The American Heritage Dictionary of the English Language, Fourth Edition. Houghton Mifflin Company, 2004. Reference.com (Retrieved 13 November 2007). ^ Dictionary.com. WordNet 3.0. Princeton University. Reference.com (Retrieved 13 November 2007). Bleaney, C. H; María Ángeles Gallego. Afghanistan: a bibliography. BRILL, 2006. ISBN 90-04-14532-X. Fowler, Corinne. Chasing tales: travel writing, journalism and the history of British ideas about Afghanistan. Rodopi, 2007. ISBN 90-420-2262-0. Johnson, Robert (2011). The Afghan Way of War: How and Why They Fight. Oxford University Press. ISBN 978-0199798568. http://books.google.com.pk/books?id=lNuH5YQJr6UC&source=gbs_navlinks_s. Omrani, Bijan & Leeming, Matthew Afghanistan: A Companion and Guide. Odyssey Publications, 2nd Edition, 2011. ISBN 962-217-816-2. Romano, Amy A Historical Atlas of Afghanistan. The Rosen Publishing Group, 2003. ISBN 0-8239-3863-8. Runion, Meredith L. The history of Afghanistan. Greenwood Publishing Group, 2007. ISBN 0-313-33798-5. This page uses content from the English language Wikipedia. The original content was at Afghanistan. The list of authors can be seen in the page history. As with this Familypedia wiki, the content of Wikipedia is available under the Creative Commons License.